A boudoir spy falls for an underworld informant whose lack of faith in love rivals his own. 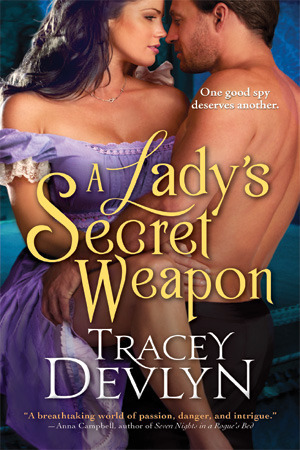 Boudoir spy Ethan deBeau, Lord Danforth, has charmed his way into the beds of wives and mistresses of powerful men across England and Europe. After breaking protocol to save a loved one, he is sent to London to locate a missing child, an assignment any junior intelligence officer could accomplish. Who knew a proprietress, with a penchant for fixing things, would swoop in to complicate his mission? He soon learns she harbors more secrets than the Foreign Office and sets about uncovering each one, kiss by kiss. For years, Sydney Hunt, proprietress of the Hunt Agency, has worked to improve the lives of those in service by negotiating better employment terms for them and ensuring they are not sent to abusive households. When word reaches her of strange activities occurring at a local home for orphans, she begins to investigate, using her extensive system of spies. Little did she realize that she would soon join forces with a notorious rake, who represents everything she despises in a man. The closer they come to locating the missing child, the more they realize they have stumbled into the middle of a dangerous and intricate web, pitting one powerful country against another. Entrenched in London’s underworld, with his beautiful proprietress, Ethan soon realizes everything he ever wanted was trembling with honor and righteous anger at his side. Does his realization come to late? Will his enemy make him choose between his beloved country and his newfound love?